Today's post is a review of the Multi-Facet Palette by Illamasqua in the shade Aura. I could literally do my whole face from this palette for a long time and not be sad about it. 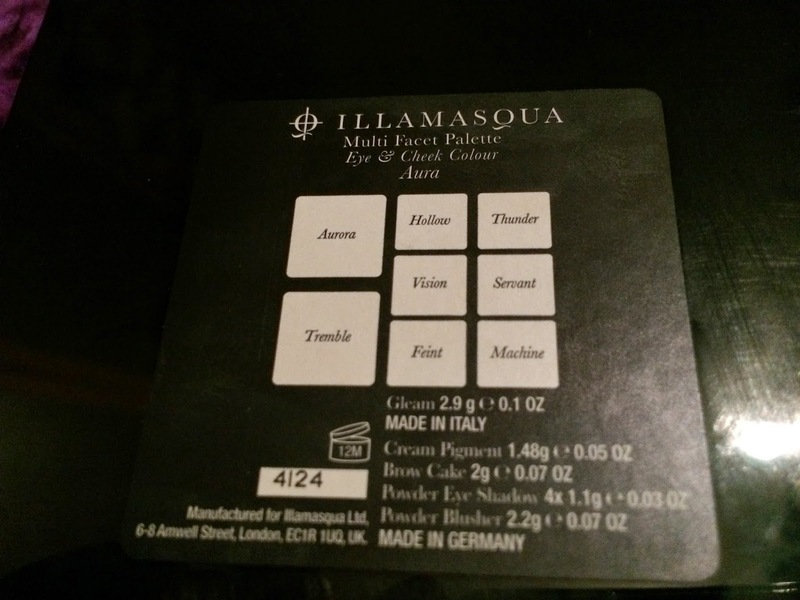 The formula of the products in this palette is amazing, which is no surprise as the quality of Illamasqua's products is consistently exceptional. On the left we have Aurora Cream Highlighter (champagne, £20) and Tremble Powder Blusher (soft lilac pink, matte finish £21.50). Down the middle we have Hollow Cream Pigment (toffee, £17.50), Eyeshadow in Vision (soft yellow cream, shimmer finish £15.50) and Eyeshadow in Feint (warm pink chocolate, matte finish £15.50). On the right we have Thunder Eye Brow Cake (dark brown £15.50), Eyeshadow in Servant (pale eggshell, matte finish £15.50) and Eyeshadow in Machine (rich charcoal black with glitter £15.50). I have used these products quite a lot now (photo was taken when I first bought it!). I really love the blusher, highlight and brow cake - I find myself reaching for them frequently. The blusher is perfect for me, Tremble is a super girly colour but it's matte so it doesn't leave my face coloured in shimmer. The actual blush is soft and blendable which is always a plus. As for the brow cake, it isn't the first time I have encountered this product as I've been purchasing it for about 2 years now! I love Illamasqua's brow powders, they aren't too heavy and, applied properly, give the illusion of naturally perfect eyebrows. I like my brows to look polished but not overdone and this product helps me to achieve this. The highlight is lovely. Aurora is the classic champagne color which suits most skin tones. The formula is non-greasy and it doesn't clog the pores. I only contour on nights out so Hollow hasn't got that much use. I enjoy using it though and it isn't greasy either. I use the eyeshadows fairly often. I love using Servant all over the lid and Vision as a highlight. I like to use Machine to set my gel liner, it's glittery so it gives such a nice sparkly finish to my liner. The eyeshadows all have great staying powder, I often forget to use a base or a primer and they still last at least 10 hours without creasing at all. £££: £45 for the palette, I have marked the prices of individual products above. 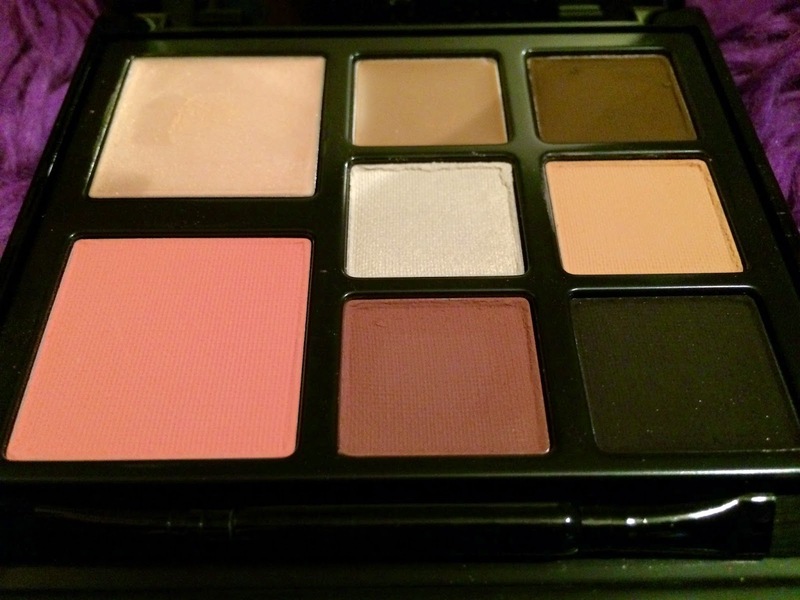 Give this palette a go if you think you will use the majority of the products in there! (I loooove this palette). It's a fairly good price and you get to try lots of Illamasqua's offerings.